Canton, Illinois brownfield redevelopment | Vandewalle & Associates, Inc.
With a population of about 14,000, the City of Canton, Illinois, lost over 3,000 jobs when International Harvester (IH) closed its 33-acre downtown plant in 1984. Following that, the site’s history was tumultuous—plagued with fires, bankruptcies, and environmental citations. Recognizing that the future growth and development of Canton depended on eliminating the site’s blighted conditions, the City sought funding assistance to clean it up and return it productive use. An initial $200,000 USEPA award catalyzed the City’s work redevelop this complex site. The City hired Vandewalle & Associates in 1998 to manage this complex brownfield redevelopment project. The firm’s efforts have proven critical for procuring over $5 million in funding and technical assistance to advance assessment, clean up, and redevelopment of the site. 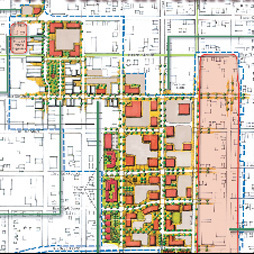 Vandewalle & Associates prepared a site redevelopment plan to determine land use mix and densities considering community input, redevelopment opportunities, and environmental conditions. The firm also provided a broad range of services including facilitating stakeholder meetings, retaining agency support, and reviewing and negotiating development proposals in the context of the site’s environmental conditions. Through the persistent efforts of the project team managed by Vandewalle & Associates, a highly visible and accessible portion of the site captured the interest of the late Bill Cook of Cook Medical Devices, a privately-held, multi-billion dollar corporation providing a wide range of medical supplies across the globe. A native of Canton, Mr. Cook and his team have invested over $20 million in two high tech medical device facilities on the former IH site, creating an initial 150 jobs during the height of the Great Recession, with the potential to double that. Cook’s initial investment has stimulated over $150 million of community-wide investment since 2009. The City of Canton, Spoon River Partnership for Economic Development, and the State of Illinois all partnered on central Canton reinvestment projects including a new hotel built by Cook and numerous downtown redevelopment and façade improvement projects. In 2012, Fulton County saw more housing starts than in the prior fifteen years combined, demonstrating the broader economic impacts realized from these investments. Overall, this project demonstrates that transformational change can happen when community leaders and stakeholders commit to the often long and difficult work necessary to position contaminated and blighted brownfield sites for reuse.